This year’s event is from Monday, November 12th to Friday, November 16th. Fans of the Tennessee Volunteers and the Kentucky Wildcats compete all week to see who can donate the most lifesaving blood. Kentucky has won the past several years. We need everyone’s help to break the streak. Scheduling changes now mean the Kentucky game is now the week before the competition. In recent years, this has meant a decline in blood donations. At its peak, the competition was responsible for over 6,500 blood donations; most recently, only 4,600 donors participated. However, we have faith this year will be the year! 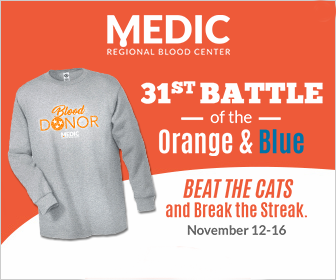 All Donors will receive a $10 Amazon Gift Card, Free Long Sleeve T-Shirt, a Free small pizza from Papa John’s, a Free ticket to the Fantasy of Trees, and a Free Texas Roadhouse Appetizer!